For those who enjoy solitude, nothing beats a well-painted interior view. It puts you in a quiet room that nobody else will enter. Ever. Among the earliest examples are those fragments of first-century Roman murals found at the Art Institute of Chicago, which feel like extensions of some palatial courtyard. In other examples, rooms are painted so well that you hardly notice whatever human figures have been placed into them. For example, Vermeer’s “The Music Lesson.” The sense of atmosphere, light, tangible surfaces and deep space is so delicious, who cares about the people in the background? Most of Vuillard’s interiors also have people in them, but they blend so well into the patterned wallpaper, the ambience of the room is not disrupted. And then there’s Van Gogh. 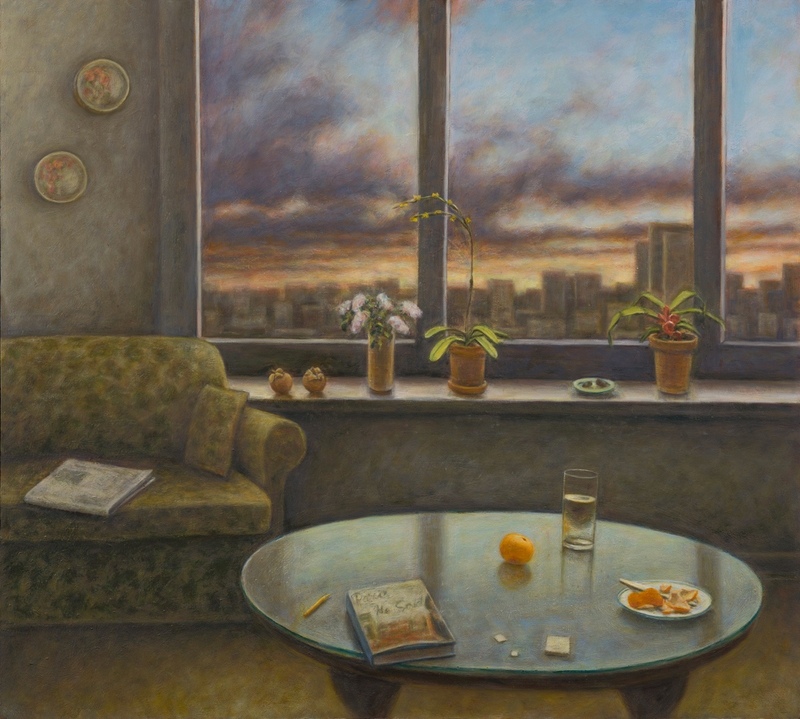 His bedroom views, exhibited in Chicago earlier this year, vibrate with manic energy. More recently, Magritte painted ordinary rooms as if they concealed some extraordinary mystery. Susan Kraut’s rooms do none of the above. Her rooms are nothing more than ordinary. The space is flattened, the colors muted. The paint expresses neither its application nor the surfaces it depicts. The rooms exist more like a memory or dream than a depiction of an actual room. Within the rooms are several small, discrete objects, like a potted cactus on the window sill or a pencil on the table. These forms are flat and tentative, yet great care has been taken in their arrangement. 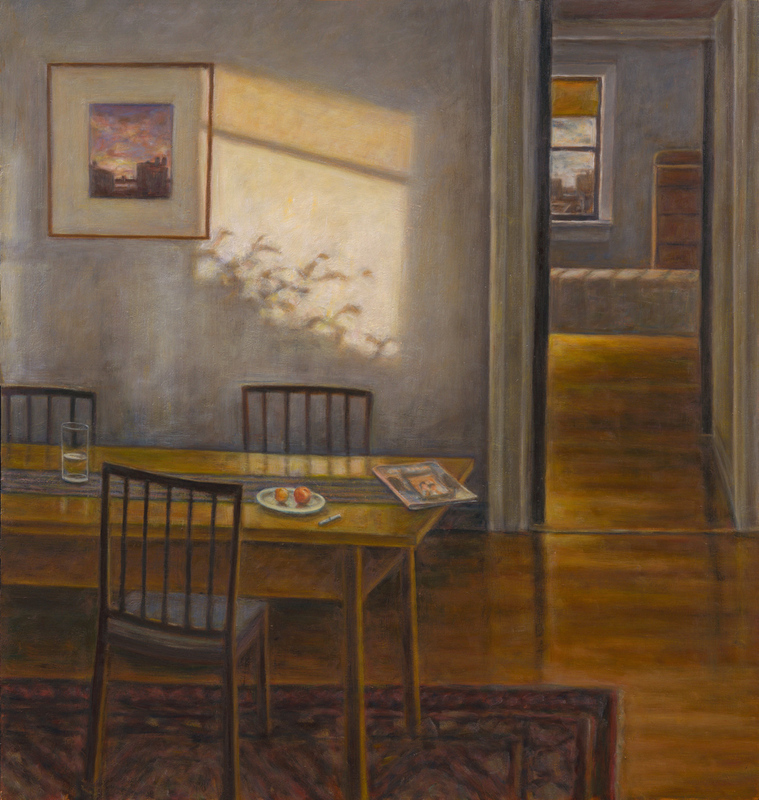 We may face the wall of a rather dreary room, but there is always a landscape painting, a door or a window through which one peers into the glow of a late-afternoon sky. It feels like sitting in the pew of an empty church to contemplate eternity.